By thaliakr February 17, 2014 13 commentsBible, body image, church, church calendar, fasting, food, generosity, grief, lament, Lent, social justice, spiritualityEastern Orthodox Church, fasting during Lent, Isaiah, Old Testament, Roman Catholic Church, Scot McKnight, The Ancient Practices, What's the point of Lent? No one can be right or wrong about how to celebrate Lent, I realised the other day. Lent is a church tradition, not something instituted by Jesus or the apostles. So we’re all in the same boat, theologically speaking, of needing to figure out how Lenten practices might sensibly and meaningfully connect us to God in significant ways. The oldest churches – the Eastern Orthodox and the (Western) Roman Catholic – have church-wide practices that all the faithful are called to adopt, according to their health and stamina, for the several weeks leading up to Easter. But even the Roman Catholic practices have changed significantly even over the last century, so there’s more conceptual room than usual for people to decide for themselves what would make most sense for them. If, like me, you’re outside those historical traditions, you have full freedom to take on whatever Lenten practice you like. Well, that’s great. 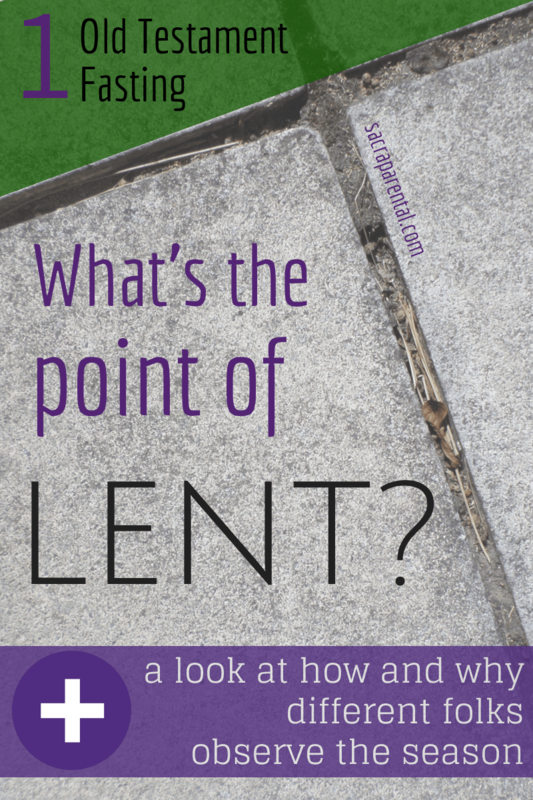 But as I’ve been considering various options for me and my family, I’ve got myself a bit tangled when it comes to this basic question: what’s the point of Lent? Growing up surrounded by a range of Protestants following different traditions, the vague understanding I had in my twenties was that fasting in Lent (from television or chocolate, usually) was something to do with entering into Christ’s suffering. But I was never quite convinced. Going without junk food or alcohol isn’t very close to betrayal, flogging, and crucifixion. I’ve also been wary of fasts that have mixed motives. If I adopted a healthier diet by cutting out animal products or junk food, for instance, I would get the suspiciously convenient benefit of weight-loss. I’d find it genuinely hard to know if I was wanting to be closer to Jesus or closer to my ideal BMI. Then there’s the time-frame. If I were going to give up booze, gossip or comics for forty days, to focus more on Christ, then why not permanently? I have a high need for things to make sense – at least to me. So after doing some research (going beyond Wikipedia, even, to actual books! ), this mini-series leading up to Lent itself is an outline of what I’ve gleaned about how Christians have thought about Lenten practices over the last 2000 years. On the way, I’m going to try and distill some guiding principles for my own decisions this Lent. Feel free to argue with me! Lent is of course a Jesus-based, New Testament kind of thing, but given how closely Lent and fasting go together, it’s worth a look at what the Jewish practice of fasting was all about at the time Jesus was in Israel. Here’s the biggest theological risk I see in fasting without being clear of why: modern fasting often turns into an attempt to manipulate God. When it’s spelt out like that, most of us will wince a bit. Not only is that kind of thinking unhelpful, it turns out it has nothing to do with what fasting was about in the Old Testament. Try defining it, and I’ll make a suggestion. Go ahead — in your mind define it. Here’s my suggestion: If, in defining fasting, we are tempted to define fasting as something we do “in order to” get something, I suggest we need to look again at the deepest wells of the Christian fasting tradition: the Bible. In Fasting: The Ancient Practices I suggest that in the Christian tradition we somehow got sidetracked. Instead of seeing fasting as a discipline we use, do, or practice “in order to” get answers to prayers, “in order to” become more attuned to God, or “in order to” become more spiritual, the Bible’s focus is on fasting as a response to life’s sacred, grievous moments. If in defining fasting you get quickly to the “in order” element… I suggest look again at the Bible. In the Old Testament, and in the time of Jesus, fasting was a whole-body, natural response to a ‘sacred, grievous moment’. That’s something worth holding onto as we consider our modern practice. Fasting, like other spiritual practices, easily drifted into self-righteousness and self-absorption among ancient Israelites. If fasting did not lead to compassion for others, God revealed through the prophet Isaiah, then it was falling apart before it did its work. Fasting is a response, not a means to an end. Fasting needs to be connected to acts of compassion and generosity. The next post will pick up at the time of Jesus and explore the beginnings of the early Christian practice of fasting before Easter. In the meantime, I’d love to hear your thoughts. What have you grown up thinking or practising when it comes to fasting or Lent or both? What do you think of what Scot McKnight says? The next post in this series is Jesus and the Early Church, and the series list is here. I’m preparing a Lent series for the blog, and now for a few friends’ churches, that is inspired by how my family celebrated Advent. Check it out here, and please feel free to let me know what you think, and what I can add or subtract. You can also see my Lent Pinterest board, follow Sacraparental on Facebook for extra daily snippets and sign up at the top of the right-hand sidebar to get an email whenever there’s a new post on the blog. Thanks for that Thalia! It’s got me thinking! That’s great to hear, Nic, thank you! Look forward to hearing more! Not really in tune with the whole mindfulness, thoughtfulness thing. But you’re both giving me a heads-up, and getting me to begin the intentional thinking part in plenty of time. I must say I feel very proud, myself, to have got onto this in good time! I’ll be keen to hear what ends up happening in your house. This is really helpful. I grew up in a tradition that doesn’t observe Lent at all and have never really had any teaching on it. Since being more exposed to Lenten practices in recent years I have always found the idea of giving up chocolate or Facebook or the like a bit of a token response to Jesus’ sacrifice for us. Cool, thanks, Steph! I’m enjoying the research! I’m sitting here thinking able how I can practice Lent this year, and I’m thinkingk about fasting and what I can “give up” without it being something that benefits me – like cutting out sugar. Jen Hatmaker wrote a book called Seven in which she tries 7 different ways of living simply for a month. One of the things she does is wear the same 7 items of clothes for a month. Clothing is not an obvious fast idea, but I think it is something that gives me no benefit, and as I wear the same clothes, I’m reminded of those who don’t have a wardrobe to choose from, and I get to enjoy the feast day on Sunday by wearing anything! Scot McKnight is very keen on a distinction between fasting (no food or drink) and abstinence, and I think is a bit troubled by the Facebook/coffee/etc ‘fast’ trend. I’m still doing all my thinking as I go in this series! But I really like clothing as a visible, tangible and non-rewarding idea – def much ‘purer’ than sugar or other mixed-motive things. I was raised in a Christian family, but with no particular emphasis on Lent. Following Easter with chocolate rabbits never felt right to me. I learned a bit more about Lent through books and travel, experiencing Mardi Gras etc. I had the idea that Lent is for penitence, and the fasting related to mortification of the flesh. Since becoming a Christian Mum I’ve slowly been trying to incorporate the Church Calendar into our family life. I like the idea of giving up something to reduce distraction and better focus on Christ. But giving up something to give to others sounds quite compelling. I’d love some ideas for family-friendly rituals or ceremonies.